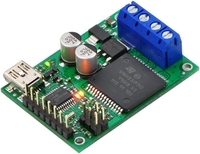 The controller can be used with feedback for closed-loop speed or position control, or it can be used without feedback as an open-loop speed control. 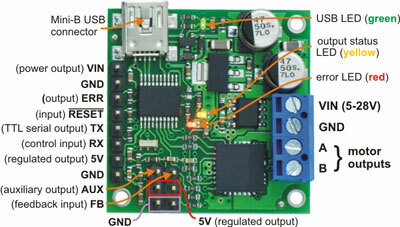 The continuous output current is approximately 3 A in the recommended operating range of 8–28 V, with derated performance down to 5 V and transient protection to 40 V. The board ships with connectors installed as shown (no soldering required). 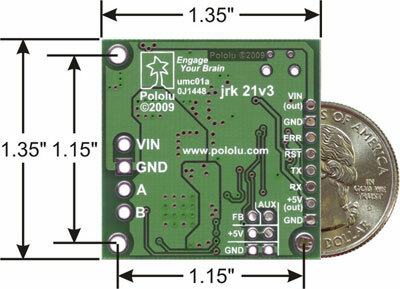 The jrk 21v3 is available in two versions: "fully assembled" with terminal blocks and 0.1" male header pins pre-installed (left picture above), and connector-free (right picture above). The connector-free version includes a 14×1 straight 0.100" breakaway male header strip and two 3.5mm, 2-pin terminal blocks, but these parts are not soldered to the board, which allows for custom installations.